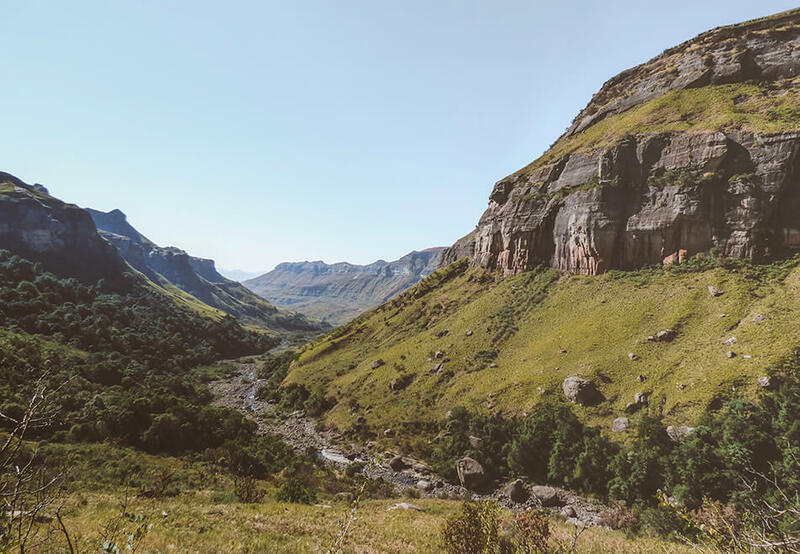 An hour and a half drive from Golden Gate Highlands National Park, one can find Royal Natal National Park, containing the famous amphitheatre. 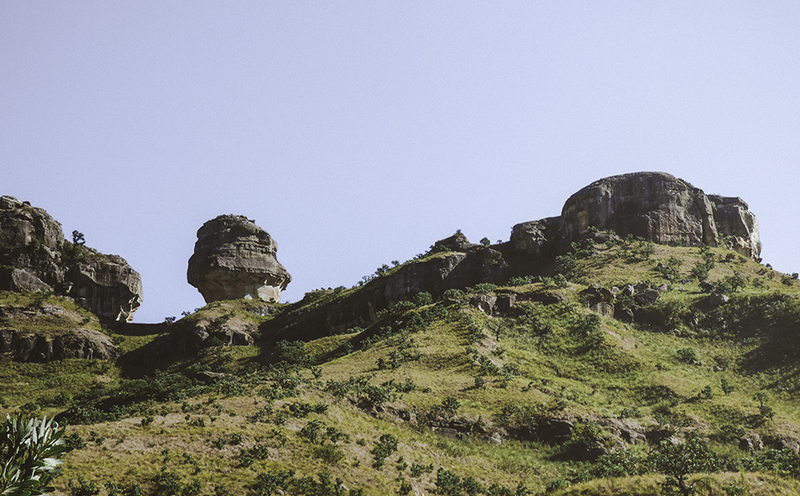 If, like us, you enjoy a nice view of the mountains and love hiking, Royal Natal NP is a paradise. 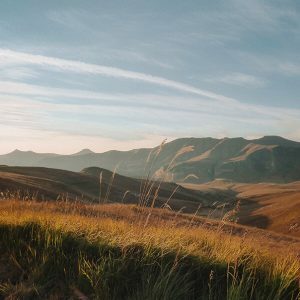 There are over 22 hiking trails ranging in difficulty and distance, so there’s something for everyone. 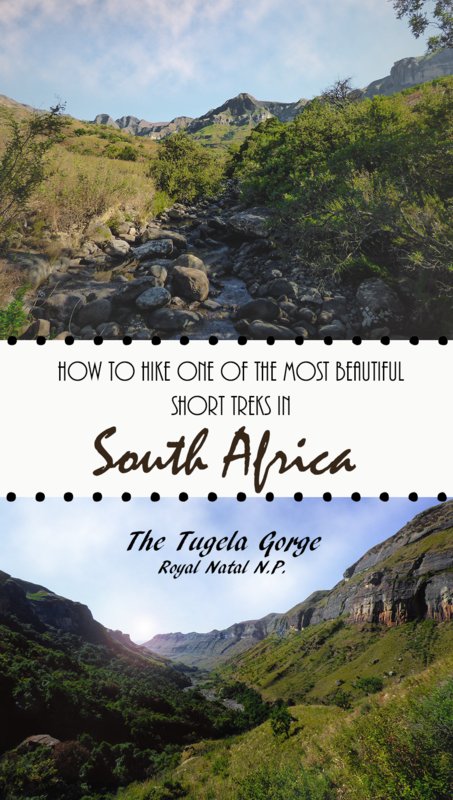 During our stay, we opted to hike the Tugela Gorge Trail. 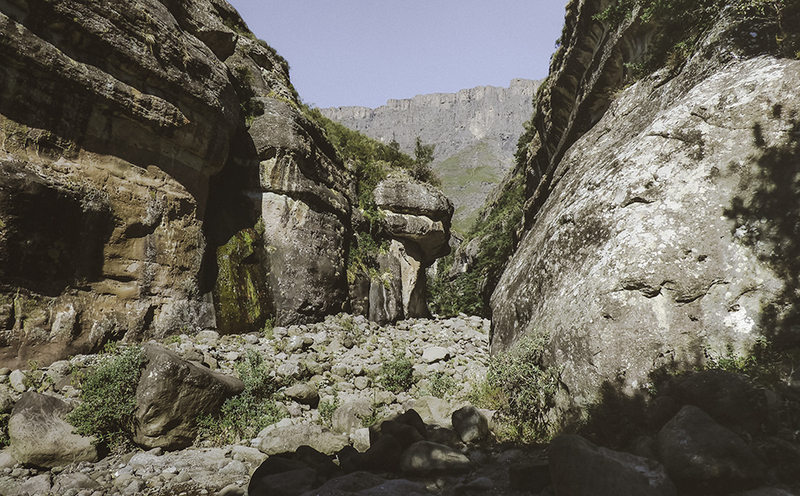 We were told the Tugela Gorge hike would be one of the finest one-day hikes in South-Africa. 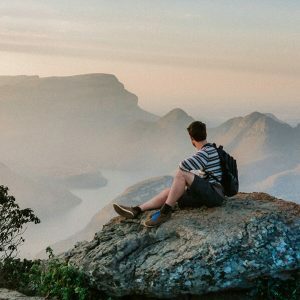 After reading several positive reviews about this hike, we were convinced… we had to see this with our own eyes and experience it with our own feet! 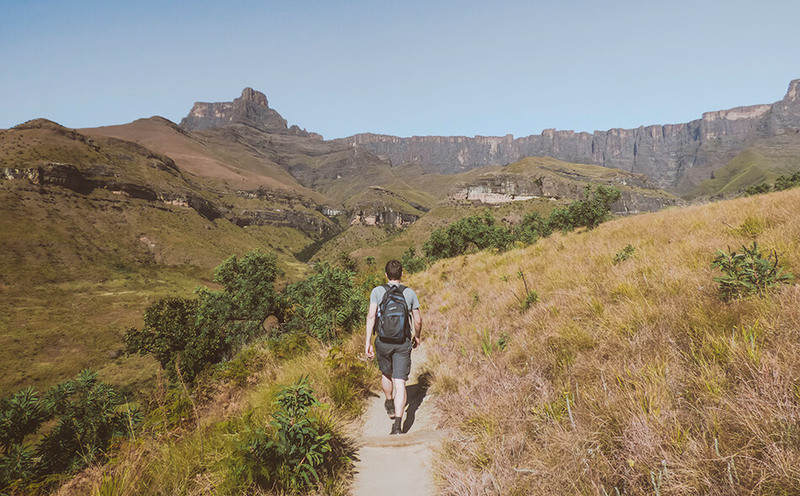 Hiking up to the Tugela Gorge to the base of the Amphitheatre was a wonderful way to experience the scenic Drakensberg mountains. We started the hike from the car park just below Thendele camp, in Royal Natal National Park. There we found a trail map and we needed to sign the mountain register before setting out. We were kind of worried we didn’t have a map, but in the end it wasn’t really necessary as the path was very obvious. When starting from the Thendele car park, the first 6 km are easy with a very good path and no special directions are needed. After about 4 kilometers, we saw a dramatically eroded sandstone pillar known as the Policeman’s Helmet on the high ground to the right. Seriously, the hike had one jaw-dropping viewpoint after the other. We were taking a crazy amount of pictures just because every angle and every turn showed something new and even more beautiful. I mean, just look at these vista’s! Getting up early that day was the best decision we made. 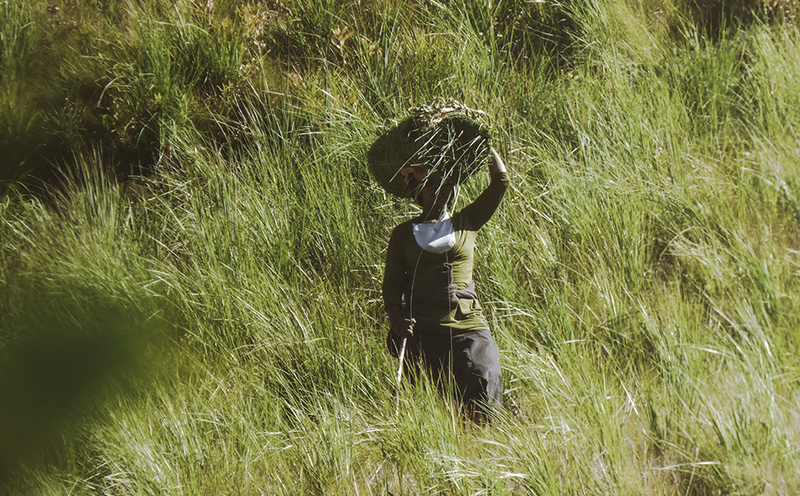 Not only did we start our hike in cooler temperatures but we were able to see some of the local women harvesting grasses. 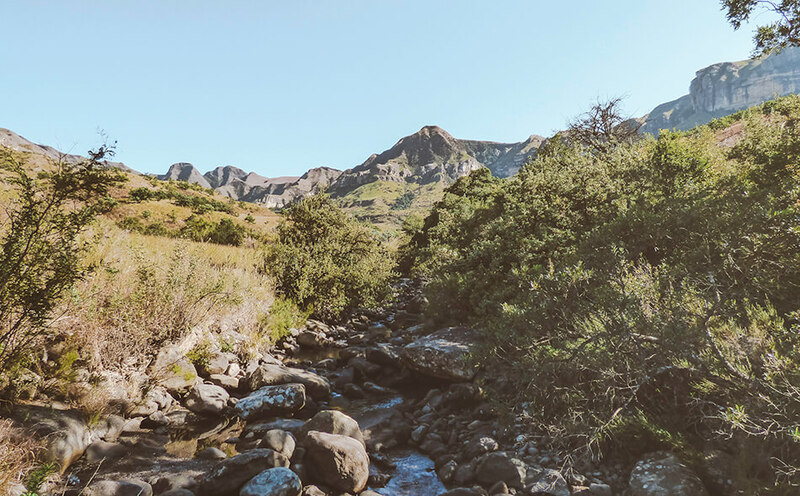 After about six kilometres, the trail descended into the Tugela River and we started to go into the river gorge. We now had about a kilometer of rock hopping up to the start of the mouth of The Tunnel. No more shade from this point on, even in autumn this place got really hot! 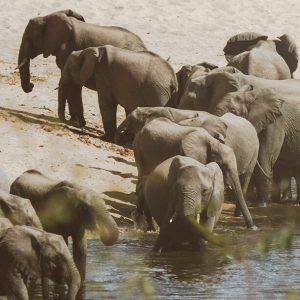 We were in South-Africa at the end of autumn so water levels were low, alas no opportunity for us to cool down. We can imagine how wonderful and fun it would be to wade through the water in the tunnel, in the heat of summer. 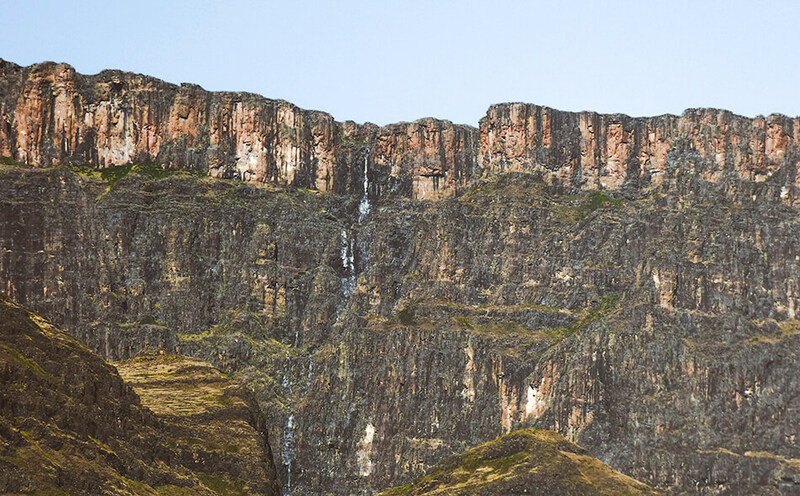 Roughly 50 metres on the other side of the tunnel, a magnificent view of the imposing basalt walls of the Amphitheatre and Tugela falls should open up. Noticed how we used the word ‘should’? Unfortunately, during our stay the river was so dry it was barely visible. We therefore did not undertake the climb via ladders to see the fall. If you’re traveling in a time when there is water, you should definitely do this last part! Apart from the length and duration of the hike, we would consider this an easy one. The path is well marked and the gradient is not difficult. Moreover, half of the walk is shaded which protects you from the blazing African sun. In our opinion, this hike is suitable for everyone with normal fitness, even for children (no strollers!). You can choose how far you walk into the canyon and return when desired. This walk is a perfect combination of an easy walk with magnificent scenery. No wonder it gets all this praise! Suitable for everyone with normal fitness, even suitable for children. – The only difficulty is the hike’s length and the boulder hopping at the end, otherwise it is not strenuous. – You spend 50% of the hike in the shade, which is nice because it can get really hot!